On this page you will find all you need to know about Thailand Train Tickets - Where to Buy, how to calculate your fare, cargo, rail passes, refunds and how to change your ticket. Car and Seat number - Each carriage on the train will have a "Car Number" card on the outside of the carriage in the middle. Sometimes when purchasing a train ticket you are asked to provide your name and your passport number or ID card number. It mostly happens when travelling on the trains that are used by many tourists or on the trains heading to the deep South-Eastern provinces of Yala, Pattani, Narathiwat and Songkhla where terrorist attacks by Islamist Separatist groups have sometimes occurred on trains passing through this troubled area . 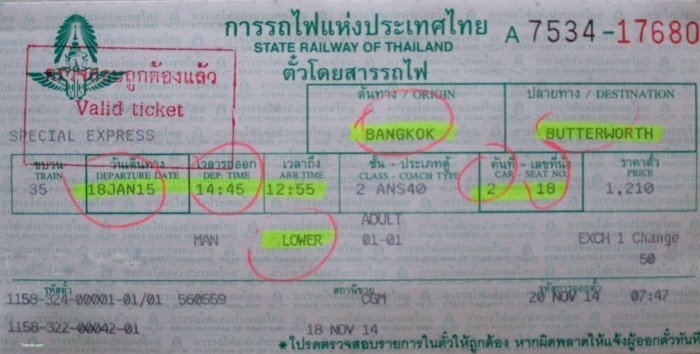 Thai train ticket are written using the Thai alphabet and so you might need help from a local to read your ticket, however it can also be printed with a mix of English words for the main pieces of information and Thai (as shown on the picture above). Thai trains fare calculation can be a little confusing if you have just arrived in the country, especially if you are coming from Malaysia where the fare structure is very simple. Hopefully by reading the following you will understand the fare structure a little more, helping you to chose which train to travel on, on each particular journey you want to take. Like most train journeys there is a set fare for the distance you want to travel and class you want to travel in. On Thai trains you can choose to travel in either 1st, 2nd or 3rd class. However, each train type may not offer all three classes. The DRC services (Special Express Diesel Railcars) are just 2nd class seat only services. Special Express trains are usually only 1st and 2nd class A/C sleeper services. Express trains usually have a much greater choice with 2nd class A/C sleepers and 2nd class seats with either A/C or Fan, as well as 3rd class fan seats. Rapid trains usually have just 2nd class sleepers with Fan and 2nd and 3rd class fan seats. Most Ordinary trains are made up of just 3rd class fan coaches, but there are a few exceptions, with the occasional service also having 2nd class fan seats. The most expensive trains are the Special Express Trains, including the Diesel Railcars (DRC) also known as Sprinter Trains. The fee for Special Express trains ranges from 170 - 190 Baht for any distance. These trains are also usually all A/C, so with both fees to add, you should really only use these services for longer distances. The fee drops, along with the speed of the train, in the following order - Express, Rapid, Ordinary. There is no additional fee for the Ordinary trains. Express trains attract an extra fee of 150 Baht for any distance, so again these are better if used only for long distances. So, in conclusion. If you are on a budget, use either the Rapid or Ordinary services on shorter journeys (under 300 km) to avoid paying all the high fees. If you like to travel with Air-Conditioning then like most hotel rooms in Thailand you have to pay an extra fee. This can make quite a difference to your fare. For example : if you are travelling up to Chiang Mai from Bangkok on the overnight Express service you would have to pay 821 Baht for a Lower Berth with A/C and 581 Baht for the same bed with just a fan. As you would expect beds on the trains come at an extra price. Fees for beds start from just 100 Baht for an upper berth in a 2nd class fan coach. Lower berths are much wider and usually cost an extra 50, 70 or 90 Baht in 2nd class, compared to the upper berth. 1st class beds / berths attract a fee of either 300 Baht (upper) or 500 Baht (lower). You could also if you wish book the whole 2 berth first class cabin to yourself for an extra 500 Baht on top of the fare for the lower berth ticket price. To make things as simple as possible, you will find all the most popular railway journeys for tourists, with both Departure / Arrival times and all the fares for each trip and train type on our website, with individual pages for each route. Just use the navigation bar on the left hand side of this page or our website search box below. 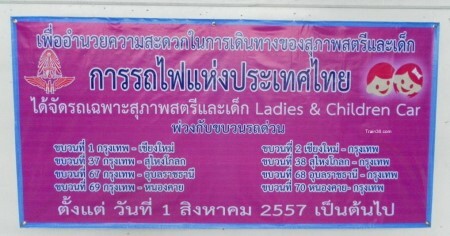 Discounts for Senior Citizens : Unfortunately there are no discounts for pensioners unless you are a Thai citizen. Train Fares for Children : Child fares for children aged 3 to 11 years old and less than 150cm offer a discount of 50% off of the basic fare, but you have to pay all the added fees. Children under 3 years old and below 100cm travel for free, but must travel on the same seat as the accompanying adult. You can buy these Rail passes at Bangkok Hualamphong train station counter number 1 only and at authorized travel agents. At the time of purchase you have to show your passport. You have to validate your Rail pass at the train station of your very first boarding. To book a seat just show your Rail pass at the ticket counters of any train stations. If you want to travel on 1st Class coach using your Rail pass, you will have to pay a surcharge as Rail passes are only valid on 2nd Class and 3rd Class. These passes are for tourists only and are not for sale to Thai people and to foreigners residing in Thailand. If you need to change your date of travel or cancel and refund your ticket, note that it can be done at any train stations and not necessarily at the station of origin of your journey or at the train station where the ticket was purchased. If you are travelling on a sleeper train you will have to pay 50THB to change your departure date. If you are travelling on a seater train you will have to pay 20THB to change your departure date or 50THB for any Air-Conditioned seat. Note that you can only change your departure date one time per ticket. Cancellations made 3 days before the departure mean that you will loose 20% of the ticket fare. Cancellations made less than 3 days up to one hour before the departure mean that you will loose 50% of the ticket fare. Cancellations made less than one hour or after the departure are non-refundable. Take your Passport / ID card along with you when changing ticket dates or cancelling your ticket. In the future this special service might be extended to other long-haul trains. All Thai trains have sufficient luggage storing areas that are close to your seat or berth. Officially there is a luggage limit, but don't worry about it and just take your luggage along with you in your compartment if you travel 1st Class, in the luggage racks by your seat if you travel in 2nd Class, or in the racks above you if you travel 3rd Class. These special items must be stored in the freight car and it will mean a small surcharge. You must buy a cargo ticket if you are travelling with such items. Want to know what the food is like on Thai trains?